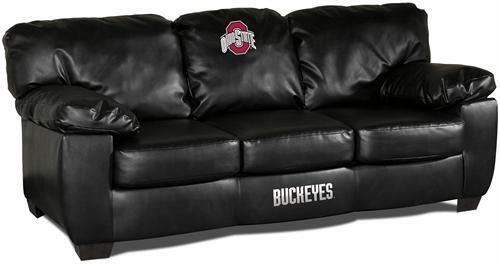 Imperial is proud to present its officially licensed Ohio State Buckeyes Leather Sofa, named the "Classic". Grab some of your favorite friends and enjoy the game. Very contemporary design, featuring black leather all over the sofa. Custom manufactured for you, near the furniture capital of the world, High Point, North Carolina. Embroidered patch logos are sewn on both center cushion and center frame. A perfect fit for the fan with discernible taste!